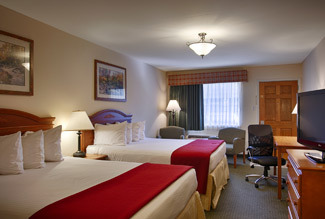 Relax and rest easy in our clean, well-appointed guestrooms. 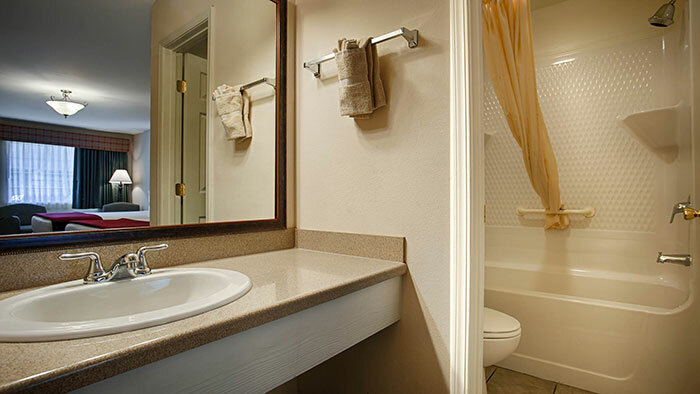 Every room features a variety of convenient in-room amenities including a 37” TV with HBO, free high-speed Wi-Fi, microwave, mini fridge and coffeemaker. Wake-up calls are free, toiletries are complimentary and our housekeeping service ensures your room is held to the highest standards of cleanliness. 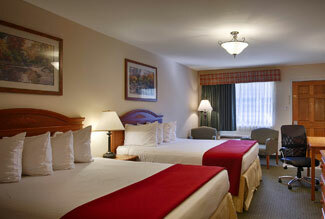 Choose a room to suit your needs and, when you’re ready, book online for our guaranteed best rates. 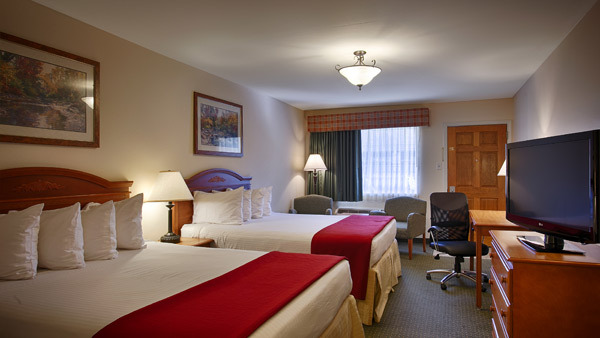 This room includes two queen-sized beds and all our standard in-room amenities including a 37” TV with HBO, free high-speed Wi-Fi, microwave, mini fridge and coffeemaker, iron, ironing board, clock radio, hair dryer, desk and chair. 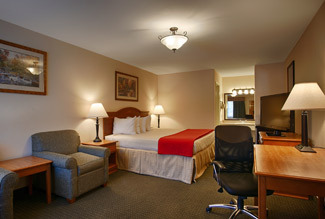 This room includes one king-sized bed and all our standard in-room amenities including a 37” TV with HBO, free high-speed Wi-Fi, microwave, mini fridge and coffeemaker, iron, ironing board, clock radio, hair dryer, desk and chair. For the comfort and safety of our hearing impaired guests this room includes closed-caption television and an enhanced doorbell that buzzes & flashes inside the room. 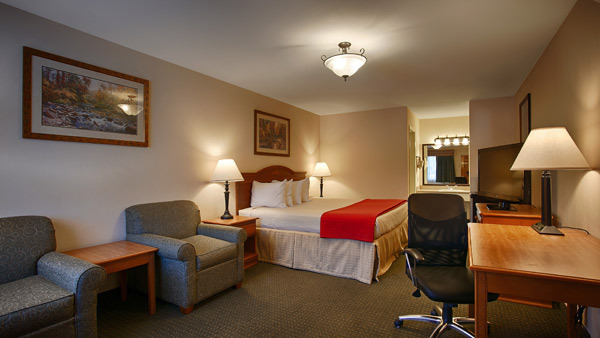 It features one king-sized bed and all our standard in-room amenities including a 37” TV with HBO, free high-speed Wi-Fi, microwave, mini fridge and coffeemaker, iron, ironing board, clock radio, hair dryer, desk and chair. For the comfort and safety of our hearing impaired guests this room includes closed-caption television and an enhanced doorbell that buzzes & flashes inside the room. 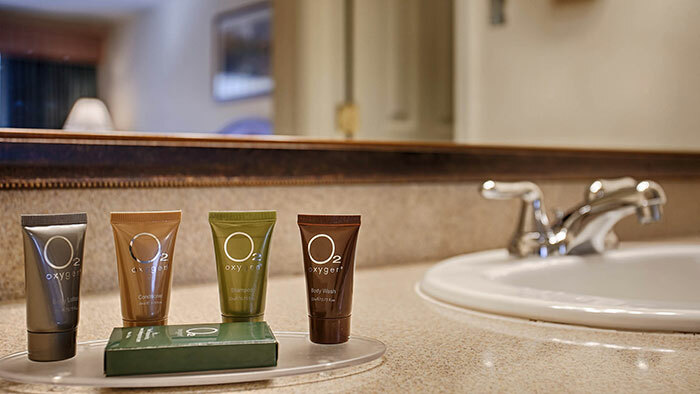 It features two queen-sized beds and all our standard in-room amenities including a 37” TV with HBO, free high-speed Wi-Fi, microwave, mini fridge and coffeemaker, iron and ironing board, clock radio, hair dryer, desk and chair. Actual room may be different than displayed.Desk and chair not available in this room. 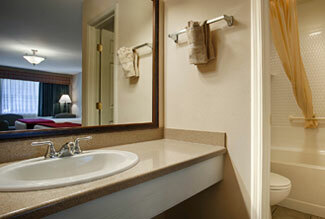 For the comfort and safety of our disabled guests this room includes enhanced mobility assistance features. It is furnished with one king-sized bed and all our standard in-room amenities including a 37” TV with HBO, free high-speed Wi-Fi, microwave, mini fridge and coffeemaker, iron, ironing board, clock radio and hair dryer. Actual room may be different than displayed. Desk and chair not available in this room. 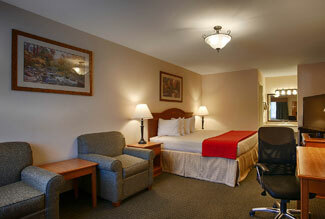 For the comfort and safety of our disabled guests this room includes enhanced mobility assistance features. It is furnished with two queen-sized beds and all our standard in-room amenities including a 37” TV with HBO, free high-speed Wi-Fi, microwave, mini fridge and coffeemaker, iron, ironing board, clock radio and hair dryer.